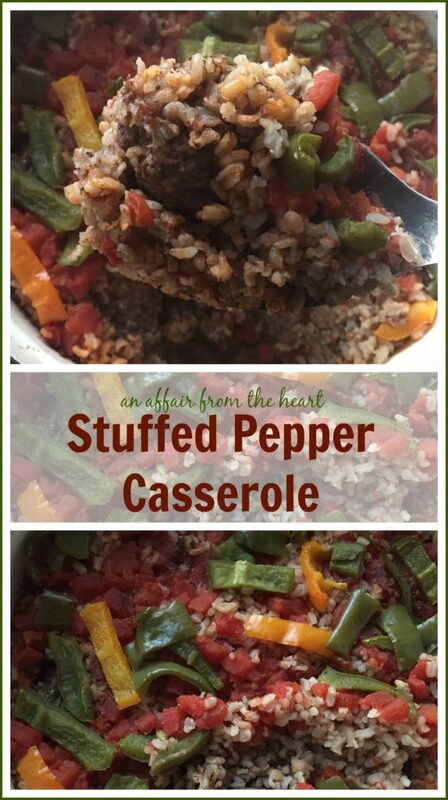 One pot casserole with the flavors of stuffed peppers, prepped in minutes. soup, meatballs, meatloaf —and of course the traditional stuffed peppers. I have made them chipotle style and philly cheese steak style. I seriously love them so much! A couple of weeks ago, I was ready to make stuffed peppers using some of the fabulous peppers from my son’s garden. He had picked all of them right before it got cold. He had LOTS of them. They were beautiful peppers, but they were really long and skinny, I wasn’t sure how I was going to stuff them. So, I sliced a bunch of them and made my stuffed peppers casserole style instead! 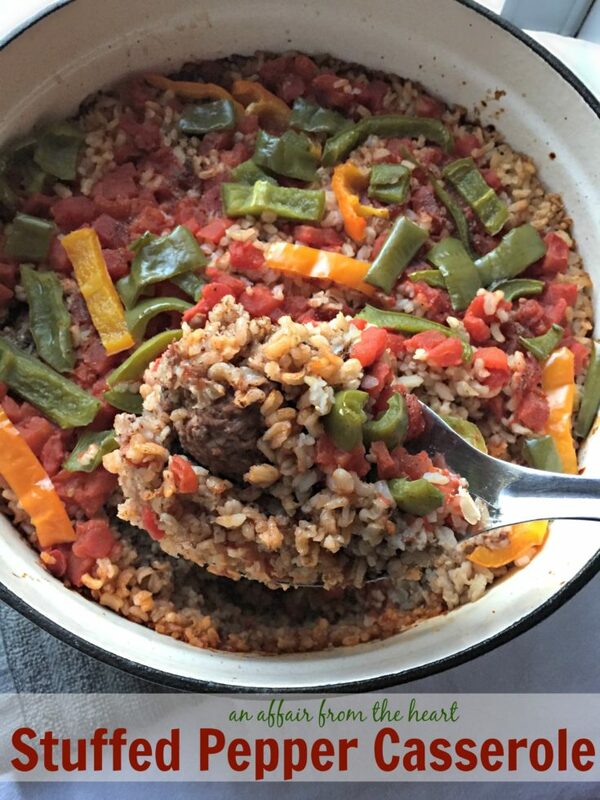 I layered rice, meatballs, tomatoes and peppers in my dutch oven, and baked it up. It was AMAZING! Next time give it a try and see what your family thinks! Preheat oven to 350 degrees. Spray 2 quart casserole dish with non-stick spray. Prepare minute rice as directed on box, using beef stock instead of water. Ball ground beef into meatballs. Spread half of the rice into the bottom of the dish, lay meatballs on top, sprinkle with half of the peppers, pour can of tomato sauce over the top. Sprinkle with salt and pepper. Top with remaining rice, sprinkle with remaining peppers, pour diced tomatoes over the top, sprinkle with salt and pepper. Place lid on dish, bake for 90 minutes.